Twenty Masters Deep Ride 24'', Ride Cymbal from Paiste in the Twenty Masters series. The Twenty Masters Collection is an assemblage of manufactured cymbals made of CuSn20 bronze - eleven ride models integrating the inspirations of international top drummers. The Dark Rides, available in 20" and 22", are designed to meet the requirements of Jazz drummers that seek vintage sound. Their dark-smoky vibe and soft feel suit dynamic playing in quiet to medium-loud combos. The 20" Dark Crash Ride is lighter, hence provides somewhat more wash but features the same vintage-earthy timbre as the Dark Ride. The Dark Crisp Rides in 20" and 22" feature the same traditional-dark color tone. Somewhat heavier than the Dark Rides, these models are suitable for drummers in medium-loud settings that need more stick definition but don't want to miss the lively intensity. The 20" Sweet Ride was developed in collaboration with French Jazz icon André "Dédé" Ceccarelli. The smooth, silvery ping over the warm, soft basic character makes this ride good for sophisticated applications in smaller bands. Clear stick definition and a full, warm and lively sound characterize the 20" and 21" Medium Rides. Due to its character this responsive cymbal suits studio and stage in various musical settings from Fusion to Pop. The 20" and 21" Dark Dry Ride has a raw surface with numerous hammering marks graced by wide lathing. 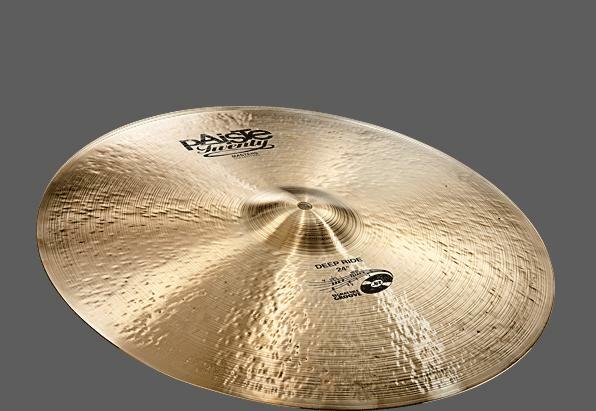 The hallmark of these cymbals is a defined but dark and warm stick sound. Jazz players that prefer a controllable and dry sound, as well as Funk, Fusion or Pop drummers will enjoy the Dark Dry Rides. The 24" Deep Ride weighs in at more than 10 pounds and was developed in collaboration with studio-master John "JR" Robinson. For more visit Paiste Cymbals. [NAMM] Paiste Alpha Swiss Crashes Swiss cymbal maker Paiste announces the introduction of the Alpha Swiss Crashes. [NAMM] Gibraltar Turning Point Turning Point hardware is designed to get rid of wing nuts by introducing a spring-loaded, tilting mechanism called a swing nut. [NAMM] Paiste Cymbalbag Trolley Swiss cymbal maker Paiste introduces the new 22" Cymbalbag Trolley.